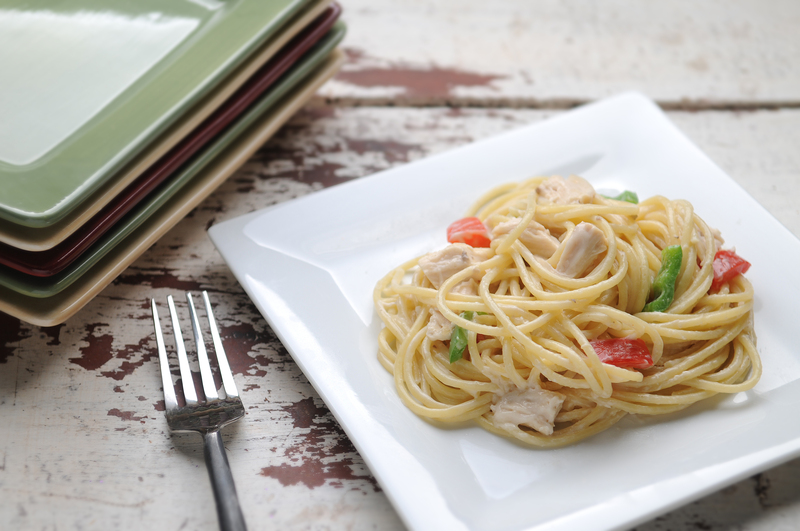 Traditional tetrazzini requires a rich (and time-consuming) béchamel sauce, but this quick recipe uses canned soup to make a family favorite fast! 1Cook the spaghetti according to package directions; drain well. 2Meanwhile, in a large saucepan, combine cooked chicken, cream of mushroom soup, and milk. Cook, stirring frequently, over medium heat until chicken is heated through and sauce is hot. 3Stir in 2/3 cup shredded Parmesan cheese. 4Add drained spaghetti to saucepan, and toss gently to coat pasta with sauce. If desired, garnish with additional Parmesan cheese. Try adding 1/2 cup dry white wine or cooking sherry to add another layer of flavor. For more veggies, sauté 1/2 cup diced onion, bell pepper, or mushrooms in 2 tablespoons melted butter. Proceed as recipe directs, stirring chicken, soup, and milk into cooked vegetables.